Maybe you’ve read Born To Run. Maybe you already knew about the Mexican Indian tribe that runs for hundreds of miles, enjoyably, in bare feet or simple sandals. Maybe you’re just looking for woven leather sandals. Either way, this page will help. The Tarahumara are a tribe who live in the Chihuahua state of Mexico, in the Copper Canyon of Mexico, and they became famous from two things. The first was a race, the highest ultramarathon in the world, the Leadville 100, and the second is a book, Born to Run by Christopher McDougall, about that race. In this book, it says, “A hidden tribe, super-athletes, and the greatest race the world has never seen.” This talks about how the Tarahumara won this race not in a pair of expensive running shoes but instead in sandals. This is a Tarahumara sandal actually made for us with a leather upper and a tire tread for the base, with a leather strap that you use to tie around your foot. Now, the Tarahumara are also famous not just for running in sandals but because they run enjoyably and comfortably well into their 70s, 80s and 90s, and some people think that part of it is because they’re running basically close to barefoot in a pair of sandals like these. So is this Tarahumara sandal a huarache? So let’s back up. Huarache is just a Spanish word that means sandal. Typically, it’s a Mexican sandal made with woven leather across the top. There are actually two versions or two things people think about when they think of huarache. The first is that woven sandal that’s what most people would wear. 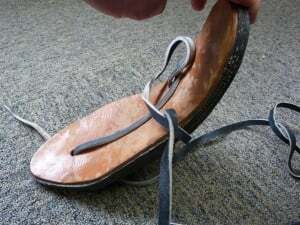 The second is the running sandal, which is like this one made by the Tarahumara, and it’s just a thong sandal made, again, out of a leather upper typically and a used tire for the base. Now, there’s another thing. If you google huarache, you will also find the Nike Air Huarache. I don’t know what the hell that thing is. It is nothing like a sandal. It is nothing like this. It is nothing like anything I’ve ever seen the Tarahumara wear, so I have no idea how they decided to use that name. Suffice it to say, you’ll find if you talk to people who are Mexican, you will find them going, “Huarache? It’s not something like this.” If you find people who are hip to the barefoot running move, they’ll think that this is a huarache and not know that the woven sandal is something similar. And if you find people wearing the Nike Air Huarache, they won’t even know what you’re talking about. Are Xero Shoes huaraches? Well, let’s back up. Because of Born to Run by Chris McDougall, most people think of huarache as a running sandal or, more specifically, a barefoot running sandal because in Born to Run, the book talks about how barefoot natural movement can be better for you than running in shoes. This is what we mean by a barefoot shoe or a barefoot sandal: something that gives you the natural movement possibilities, the fun and benefits of being barefoot plus a layer of protection, the simplest shoe you could possibly wear. So from that perspective, Xero Shoes are huaraches and, of course, we were inspired by the Tarahumara as well as the running sandals worn by other indigenous tribes. But, Xero Shoes are not the same as a Tarahumara huarache/Tarahumara running sandal. So let’s talk about why. Let’s compare. A Tarahumara huarache is actually pretty heavy and it’s also pretty stiff. So it doesn’t give you that same barefoot feel or the barefoot feel that is talked about in Born to Run and what most people refer to when they think of a barefoot running sandal. The leather laces can be a little abrasive for some people and there are not many different styles of tying that you can do with a leather lace like this. For us, because what was really important to us was natural movement and getting that barefoot feel. We chose something that was a lighter, more flexible, more versatile, and gave you more style options as well. So the first thing we, we developed our own rubber. So we have our FeelTrue rubber that is designed specifically for barefoot-style running sandals. It’s really, really flexible. It’s really lightweight. It’s really durable. It’s got great grip with our dual-chevron traction pattern on the bottom. It’s got nice grip on the top, too, with a really smooth but slightly grippy surface. 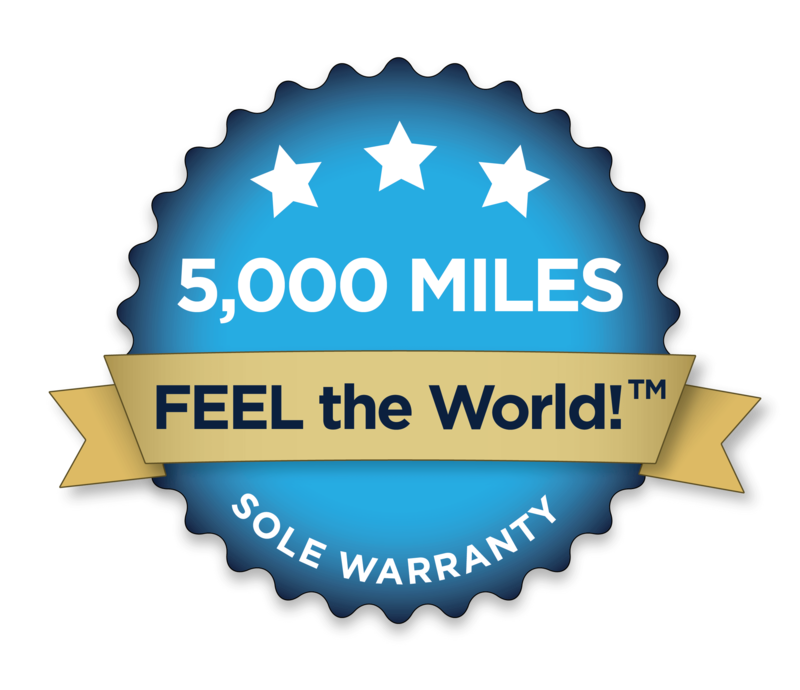 And true to our Tarahumara inspiration, our tire sandal inspiration, our soles come with a 5000-mile sole warranty. Now, we use nylon laces. We’ve got 22 different colors of laces. We use these, they’re a round lace, because they’re really soft, they’re really comfortable, they don’t stretch. And that’s actually a big difference between leather laces. Leather, when it gets wet it stretches, when it dries it contracts. That can make your sandals get looser or tighter in ways that you don’t necessarily like. And so our polyester laces, they don’t stretch, which comes in handy. Now, there are also dozens and dozens of different tying styles that you can do with these laces, and actually, you don’t even need to use our laces. You can find some other webbing and do something that actually does look similar to a Tarahumara lacing style. Our sandals that are not specifically huarache style, they’re not thong-style sandals, like our Z-Trail sport sandals, people refer to that as a huarache, I would argue incorrectly. But the basic idea of it being a barefoot-inspired or barefoot style or a sandal that allows you to have natural movement as if you’re being barefoot, from that perspective, not going to argue and I’ll let people call them what they call them. So are Xero Shoes just like Chabochi sandals? And the answer to that is simply no. 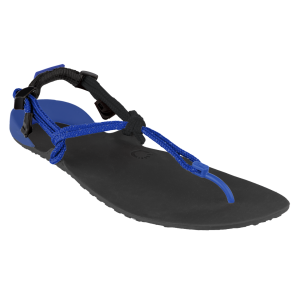 Chabochi is a company that’s making sandals that are a lot like the Tarahumara sandals with a leather upper and a used tire tread for the base and a leather strap. What we’re doing instead is something that keeps—it’s a modern version of the Tarahumara sandal. So we’re making barefoot-inspired running sandals, sandals that give you the fun and benefits of being barefoot. They provide both a layer of protection that you would want and something that’s more lightweight, more flexible, more durable, let’s your foot move more naturally, gives you more style options. And we even have some options that aren’t specifically like the Tarahumara huaraches like our sport sandals, the Z-Trail, or the Z-Trek. It’s more like Chaco, Teva, Keen, but still has that great barefoot feel because it’s really flexible and really light. 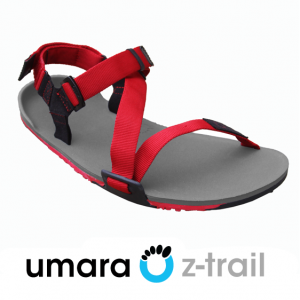 The Umara Z-Trail Sport Sandal – 10mm of comfort and protection while still allowing natural movement. So if you’re looking for something that’s kind of a ready made version of the Tarahumara huaraches, you would check out Chabochi. If you’re looking for something that’s more of a barefoot-inspired sandal, something that gives you more natural movement, more options, more comfort, more flexibility, then you would check out Xero Shoes. Leather or No? Do You Really Want ‘Tire Sandals’? When people hear about tire sandals, it’s a very exciting idea. The magic question is, do you really want tire sandals or do you want something that gives you the fun and benefits that you think you will get from tire sandals? Now, I don’t have an answer—that’s going to be up to you—but let me explain something about the notion of tire sandals like these Tarahumara huarache running sandals. They are quite heavy actually. They’re surprisingly heavy when you see them because a tire is a really heavy thing. They’re also pretty stiff, and so what we think is really important is natural movement, is letting your feet move as if they were barefoot, that same kind of freedom and flexibility but with the protection that you would want. So the stiffness makes that a little less likely. 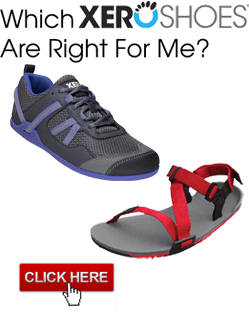 If you’re using something like Xero Shoes where you have a really thin sole, this is our 4-millimeter Connect sole, or our Z-Trail sport sandal, you still get good ground feeling in differing amounts. That’s as close to barefoot as you can get. That’s really great trail—level protection. So you still get great ground feeling but with different levels of protection. Another issue has to do with leather. We don’t use leather on our products and there are a few reasons. The first is that leather is, well, when it gets wet it can stretch and gets floppy, and when it dries it gets harder and can crack. And so with laces, you actually want a lace that doesn’t stretch because otherwise your foot can slide around in ways that you don’t like. So that’s why we’re not a big fan of leather laces. Also, the edges on leather laces, for some people that can abrade or dig into their skin, so what we use instead is a round polyester lace. So it’s only 4 mil thick. You can double it up and make it 8 mil, but that way there’s really no abrasion – there are no edges to catch your foot. The other thing with leather, some people love the look and feel of leather, I understand that, but when you get that patina, that brown thing that people associate with leather, that’s actually a collection of dirt and bacteria. So that’s another reason that we like to keep just our FeelTrue rubber so that they’re not absorbing things that could smell or potentially be bad for you. Hope that helps. If you’d like a Tarahumara style sandal for your very own, we have some options for you. So the first is a do-it-yourself kit. Now, think about this: when the Tarahumara make sandals, they’re making these specifically for your foot. They trace your foot, they cut it out, they place this hole where it goes for your unique foot shape; that means in between your toes just above the webbing between your first and second toe. So we’ve designed a modern version of this sandal and you can make them. I like to say that when you do this you develop the superpower of knowing how to make your own footwear, also known as the post zombie apocalypse career change because after the zombies come, if you know how to make sandals, you have a new job. So when you get the Xero Shoes huarache kit—it’s a do-it-yourself kit—you get a couple of things. The first is the sole. 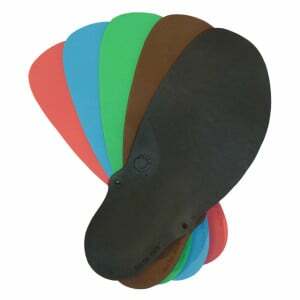 Now, we make soles in a couple of different colors and we make them in a number of different sizes, so you find the one that’s the closest to your foot size, and there are two different thicknesses. We have our 4-millimeter Connect sole and then the 6-millimeter Contact sole. So you would pick that based on how much protection you want. If you want a really barefoot feeling, just the barest amount of protection—although I got to tell you, people run marathons in these, so it’s a lot of protection but really, really barefoot feeling—then you’d go for the 4-mil. If you want a little more trail-friendly protection, the 6-mil is a better option. In fact, there’s a version of that 6-millimeter sole with a ready-to-wear huarache. 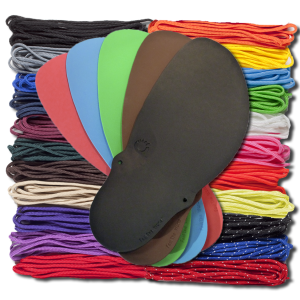 So you get the sole that’s right for you, the right color, the right size, the right thickness. You get laces. We’ve got 22 different colors of laces. Pick the one that matches your sole color or your personality. And then we’ve got a hole punch because you, again, are making these unique to your foot shape. So you’re going to end up punching a hole where it goes for your unique foot, and then you can trim these with a kitchen scissors to get the perfect fit. With the kit, you have a lot of different tying options. Everything from pretty minimalist, and this is actually not too dissimilar to some huarache tying styles that you’ll see, or you can do something like this, which is actually even closer to a Tarahumara huarache tying style. Or, you can—well, you can really go crazy. You can bling these out if you like. You can do different tying styles. You can actually add some decorative elements, add a bead or a charm or a pendant. You could in fact paint your toenails and then put on beads on your sandals to match. Or, if you really want, you can get totally crazy and seriously bling out your huarache with something like this, which Lena, wore on Shark Tank when we appeared. So that’s one option, a do-it-yourself sandal-making kit. The second option is to get a huarache-style sandal that is already made for you. We can make them for you. We do custom-made huaraches where you would trace your foot and send us that foot tracing, and then we essentially do the do-it-yourself kit for you based on your foot tracing and send that back to you. So that’s two options. The third option is just buying one of our ready-to-wear sandals. So here is our Venture, which is a Tarahumara-inspired sandal but with actually a different lacing system. This is a much easier lacing system. You can slide these on your foot and adjust the tension in a second. You just kind of pull the lace through here to get the right tension on your forefoot, and then just grab this tab and zip forward to get the right tension on your heel. Slides on and off in just a second. 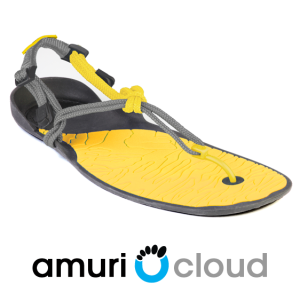 And this is our Cloud, which is the same sandal as the Venture except that we’ve laid just a little bit of BareFoam in the forefoot for a little bit of extra comfort. So if you’re just on roads or just looking for something to walk around in, incredibly comfortable with the Cloud. If you want something a little more trail-friendly, you’ll find that with the Venture. How to make them? A DIY! How do you make your own Tarahumara barefoot running sandals? Well, first of all, let me say it’s a great thing to do. You’ll love doing it. It’s a great project for kids, if you have kids. It’s a great project if kids want to show their parents how to do it. We’ve had 5-year-olds teach their parents how to make huaraches. So, highly recommended. It’s a lot of fun. Or, you can upgrade. We developed our own rubber. After we used the Vibram rubber for a while, we knew what we wanted that would give better performance characteristics, so we designed our FeelTrue rubber outsoles. So the other thing about the FeelTrue rubber outsoles that we developed, we have this great traction pattern on the bottom, a dual-chevron traction grid that gives you great grip whether you’re going uphill, downhill, fast or slow. We’ve got this really nice comfortable surface on the top that also is really grippy, dry or wet. Now, the first thing about them you’ll notice is they have this slight contour, and so it hugs your foot nicely but doesn’t provide unnecessary support. The second thing you’ll notice is they’re basically foot-shaped already rather than just a square rubber. So what you’ll do is you’ll measure your foot and find the sole that’s the correct length for your foot. If you have an exceptionally wide foot, that’s not a problem. You’ll just find the sole that matches the width of your foot because you’ll trim these down to size. We’ve already pre-punched the ankle holes, so the only thing that you need to do when you’re going to make your own sandals is take the hole punch that we give you and you’re going to mark where the hole for your toes should go. That’s going to be just in front of the webbing of your toes, like a quarter of an inch in front of the webbing of your toes. So you’ll take the punch, place it in the appropriate spot, give it a good whack with a hammer. Make sure that you put this on like a couple of magazines or a cutting board because if you hit this hard enough it can go right through your floor, so you don’t want to do that. Then, you’re going to take the lace and you’re going to lace them up. Now, I’m not going to show you how to do that here because there are dozens of different tying styles from something really, really minimalist that looks similar to the Tarahumara where you’ll make a little bead like that on the bottom or a knot on the bottom, which by the way you don’t feel because it’s in between and in front of your toes, and then you can wrap the lace around your ankle in dozens of different ways, but you can also make sandals that don’t have the toe thong, which go across your toes or around your toes, lots of different styles that we show on our website. You know, they’ve been making sandals like this for probably almost 10,000 years. It’s not rocket science or, as they said 10,000 years ago, it’s not rock science. It’ll probably take you 10 or 15 minutes the first time, but once you get good at it you can make a pair of these in like five minutes and it’s a blast. So feel the freedom, feel the fun, feel the world with your own barefoot-inspired running sandals. Can I buy them in the UK? Where can you buy huaraches? Well, all over. Thanks to the magic of the Internet, you can just do a search, find a place, and people send things all around the world. We do. We ship all around the world, so far to over I think 95 countries. If you’re in Canada, that’s our second most popular country. If you’re in the United Kingdom, that is our third most popular country. You can order directly from us, but you might want to find a store or a website that’s closer to you. That might reduce the shipping cost and the shipping time. So if you go to XeroShoes.com/stores, you will see all the various people who are carrying our products. Right now, your best bet if you’re looking for the do-it-yourself kit may be one of the stores in the UK if you’re in Europe. So take a look and if you have any questions about where to find products just drop us a line, support@xeroshoes.com, and we’ll direct you to someone near you so you can also feel the fun, feel the freedom and feel the world. Since Tarahumara huaraches have become almost synonymous with barefoot running, find more about Barefoot Running here. Because Xero Shoes were inspired by the Tarahumara and the running sandals they make, and because the Tarahumara are going through VERY difficult times — drought, lack of food and clean water, problems with medical care, drug cartel threats — we support them through donations to the Tarahumara Children’s Hospital Fund. Find out more (and donate) here. Leather or No? Do You Really Want 'Tire Sandals'?